Has your child expressed anxiety or anger after going online? This might be one of the signs your child is facing online dangers.The Internet is a powerful platform for communication, entertainment and education. These positive traits make access to the Internet essential for school and homework. It also can have a negative effect by opening the adult world to our kids who are not ready to see it yet. Unfortunatly it is being used as a tool for cyberbullying, online predators and identity theft. We can help protect our children by limiting access. Just like we set restrictions on all technological tools our children use, we need to also do what it takes to protect them from online dangers. It is very important for children to learn that any information posted on the Internet cannot be deleted. It leaves a digital footprint that neither parents nor chlidren can change even if they erase them. Back ups and other digial means keep all information that has been put online. Children should learn that things they post on Facebook and Instagram may affect their lives in the future. The Facebook profile is one of the factors that hiring managers look at and take very seriously before offering a position. We give kids smartphones at a relatively young age and it is highly important to set identity security. You probably have already declined apps your child wanted to purchase. While typing in your name and password is relatively dangerous, this is only the tip of the iceberg. You need to be aware each time your child types in your home telephone number and address that your family needs to be protected. Identity fraud is by far one of the top dangers to which you should be aware. When buying things online, children may be misled by colorful ads and prizes that are being promised after they type in a credit card number. Another online danger, which probably doesn't need an explanation, is presented with online predators. The target of online predators is usually children ages 7-14. They can quickly convince a child after chatting with them from 3 days up to 6 months to meet in real life. The recent video study by a popular internet journalist Coby Persin has shown that although parents teach kids about the dangers of online predators, 3 out of 3 girls (yes, 100%) ended up meeting a predator. As to how many predators exist, there are 750,000 registered child predators in the United States. 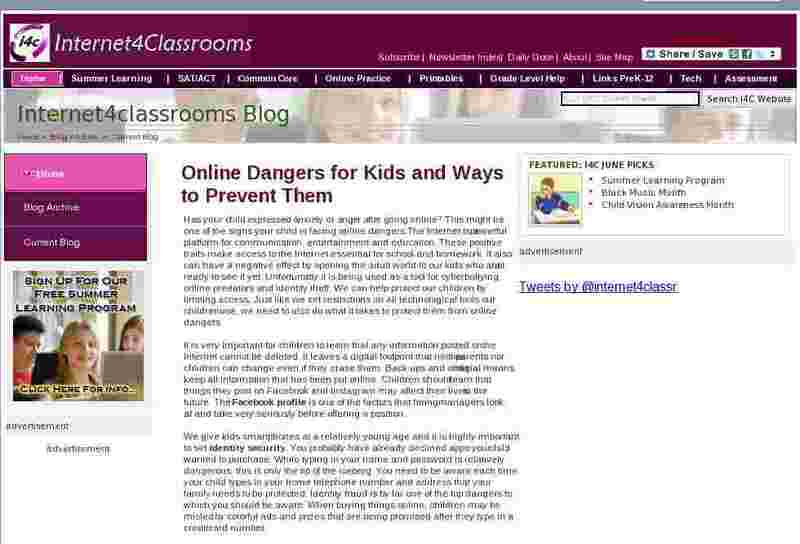 All this said, there are ways you can prevent your children or students from dealing with online dangers. The majority of kids are simply seeking communication online. Ask your child if he/she knows someone who is either bullied or has friends online no one has seen in real life. This is a famous psychological trick when kids tell everything they know about the problem by referring to their "friends". Discuss ways to tell adults about these bullying episodes. Although some parents claim it to be spying, the above mentioned dangers should convince you to set up parental controls. For PC monitoring you can install Netnanny.com, great software that will help you block inappropriate websites and view your child's browsing history. As kids tend to use smartphones 80% of the time online, you should also think of a smartphone monitoring app like Pumpic.com it is appropriate for both Android parental control and iPhone monitoring. It allows you to monitor social media accounts, IM chats, and basic texting. In addition, you can see all pictures/videos on the phone and even track real-time location of your child. All children have teen idols; they imitate them and copy in almost any way possible. Luckily, popular teen celebrities like Justin Bieber, Miley Cyrus, Demi Lovato, Selena Gomez, and others speak openly about online dangers, especially cyberbullying. You can cite their example as a rule that all teenagers go through hard times but they can become independent and successful if they fight through it. We should be the first to teach our kids about online dangers in order to prevent them. You can and should trust your child but it would be unwise to trust all Internet users. This is a post by Daisy Finn, an IT teacher and e-safety expert. You can reach her via her Google+ account.